The New Year may have just started but it brings good news for Motorsport fans all over. Forza Motorsport has announced the all new Forza Motorsport 6 exclusively for Xbox One users. The announcement was made at the North American International Auto Show in Detroit, on Tuesday. Microsoft alongside Turn 10 Studios announced the game which is under development and will be exclusively for Xbox One users. The announcement was also made on the official Forza Motorsport twitter account. The news should not come as a surprise to many Motorsport lovers because the game has been appearing every two years since 2005, when the first edition came out on Xbox, then on the Xbox 360 and now finally the sixth edition is coming for Xbox One (Forza 5 was also for Xbox One). This news was made alongside the announcement of the all new Ford-GT which will also be serving as the cover car for the game. In addition to this other performance vehicles from Ford, like the Shelby GT350 Mustang and F-150 Raptor debuted earlier at the auto show, will also be added to the game too and car lovers and gamers both can enjoy them in the new Forza 6. This is a good step taken by Microsoft which had promised lots of exciting games for Xbox One users by the end of this year and looks like they are already gearing up and fulfilling their promise. 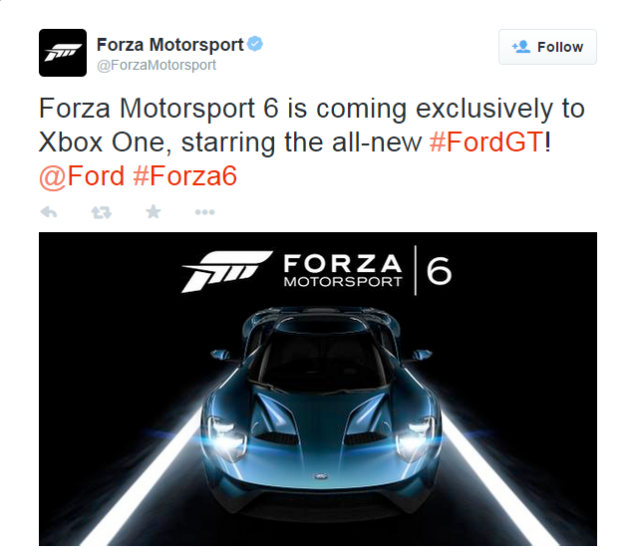 Let’s hope that Forza 6 is better than its predecessor, the Forza Motorsport 5, which was a disappointment. And that the makers understand the fact that they need to make more games like Forza Horizon 2 and the other four Motorsport editions.